Astronomy 161 is an introduction to modern astronomy, with an emphasis on the Solar System. The course begins with an exploration of the historical development of astronomy, tracing the path by which we have come to our present understanding of the Universe. Along the way we will build up the basic toolkit of physical concepts that we will need for our later explorations, specifically the nature of light, matter, and gravitation. The second part of the course is devoted to an overview of modern solar system astronomy, with particular emphasis on the constituents of the solar system, comparative planetology (structure, surfaces, & atmospheres) and the history and evolution of the solar system. We will end by discussing the exciting new discoveries of planets around other stars. The Final Exam will be Thursday, December 6, 11:30-1:18 in MP1000. The Last Week Study Guide is available. This, combined with the other 4 previous study guides, constitutes a complete set of study guides for the Final Exam. See also my recommendations for How to Study for the Ast161 Final Exam. NASA Planetary Photojournal A great collection of planetary images at JPL. 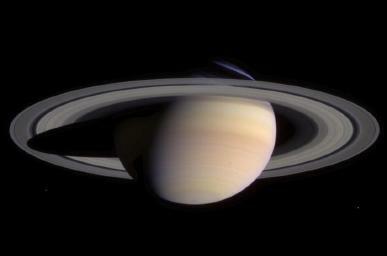 Latest pictures from the Saturn system returned by the Cassini spacecraft. Latest pictures from the Mars Exploration Rovers Spirit and Opportunity . Lectures are daily at 2:30-3:18pm in 1000 McPherson Lab on the OSU campus in Columbus. The lecture notes are outlines of the lectures, not verbatim transcripts, and they have minimal graphics to speed downloads and save on paper. Notes will generally become available at the beginning of the week in which the lectures occur. In the past, students have found it very helpful to make copies of these notes before class, and then follow along with them in lecture, making their own notes in the margins. You will find this much easier than trying to take detailed notes of everything I say. I wish to strongly emphasize that these are only outlines of my lectures provided as aids to following along in class, not as substitutes for regularly attendance. Historically, students who have gotten into the bad habit of skipping class and just reading the web notes have performed one whole grade point below the class average. All of the written materials provided in these web pages are copyrighted by the course instructor, except as noted. In addition, some images and animations are also copyrighted by the instructor, while others are copyrighted by the original sources. These latter appear with the written permission of the copyright holders. Please read the Copyright Statement before you make copies of any of these web pages for any purpose. Use of these notes implies that you have read and understood the copyright statement. Copyright � Richard W. Pogge. All Rights Reserved.